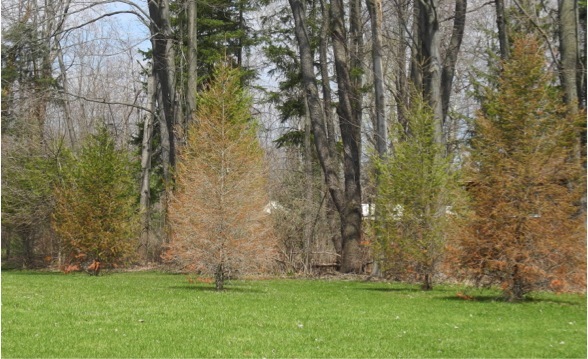 Wet spring weather brought on an outbreak of a disease on familiar shade trees. 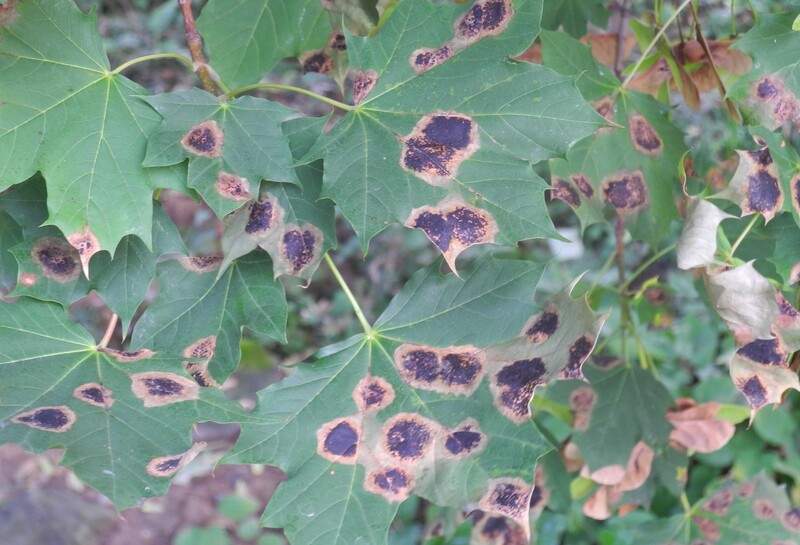 Anthracnose has affected certain species of maple, sycamore and oak trees. 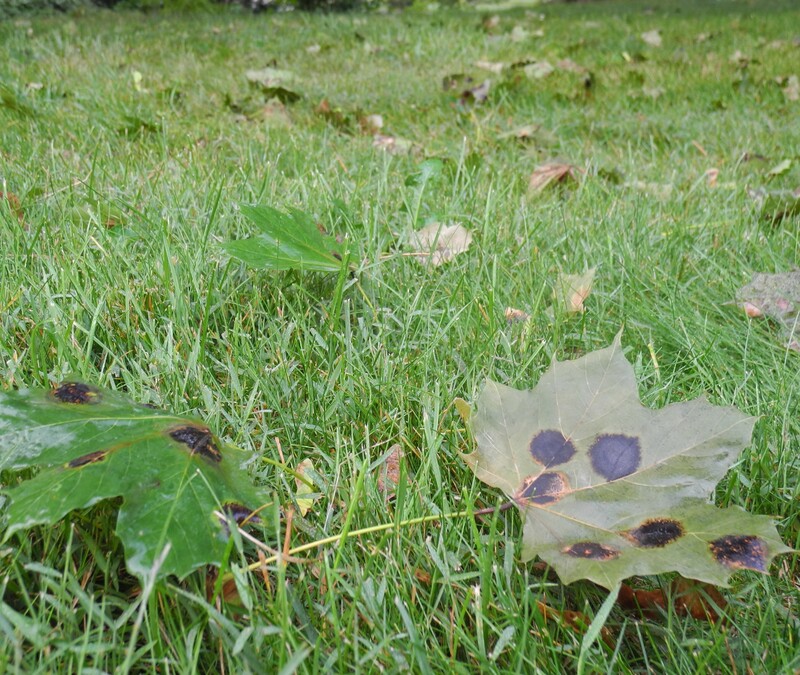 Anthracnose is caused by fungi and can only infect leaves when there is consistent moisture and cool temperatures at the time the leaves expand in the spring. Sliver Maple leaf with anthracnose lesions. 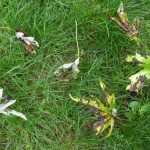 Raking and removing the leaves, now or in the fall, can help remove some of the fungal spores so it is a good practice to help reduce the disease pressure for next year. 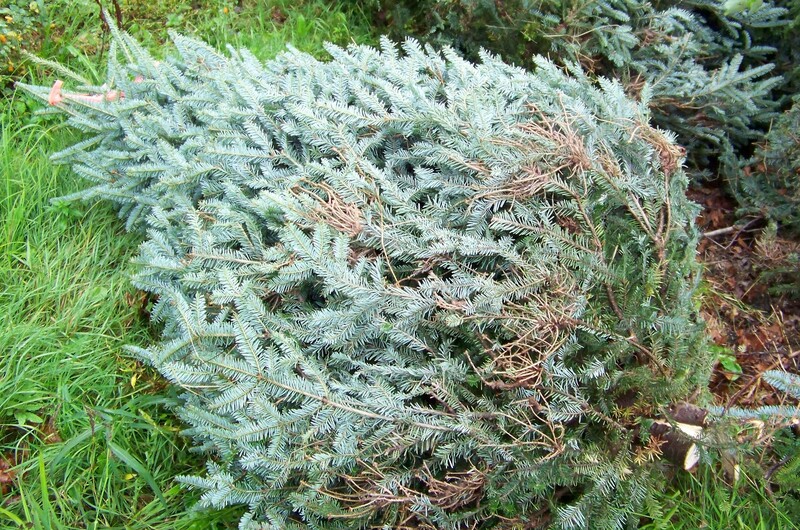 The leaves can be composted (as long as the compost bin is not right below the tree) without risk of spreading back to the tree. The good news is with warmer and drier conditions the disease will be no longer be a problem. 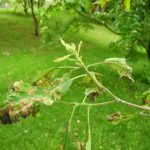 No treatment is necessary and the overall health of shade trees is not affected by anthracnose. 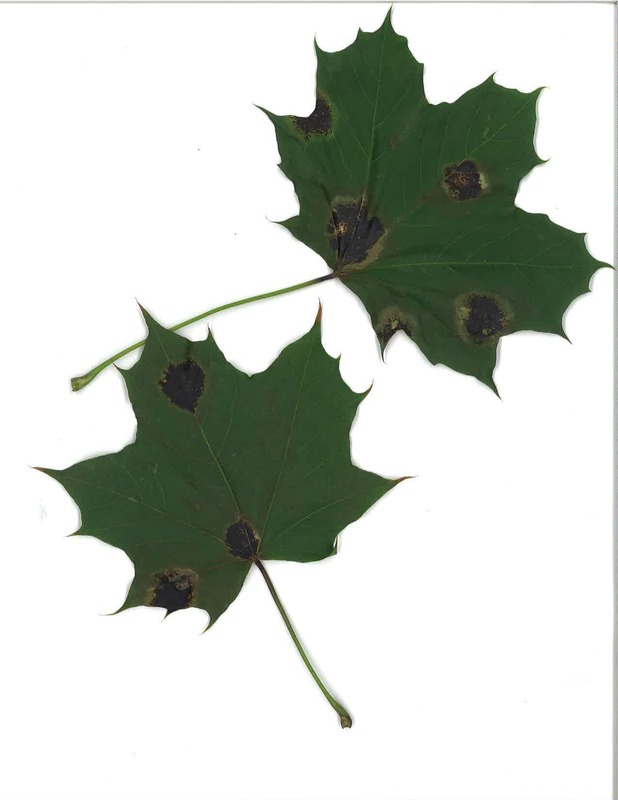 Anthracnose can lead to dieback especially on sycamore. Healthy new growth on sycamore. Due to the rainy season we had, this disease is prevalent but if we have more normal spring weather next year it is quite possible the disease will not be seen at all. Anthracnose blighted bur oak leaves. Anthracnose on older leaves. New emerging foliage is healthy. 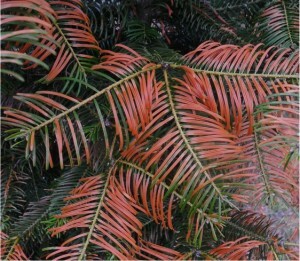 The spotted leaves will remain that way and some of those affected leaves may fall off early. 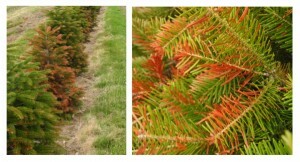 However, any new growth that emerges in June and through the summer will be healthy. 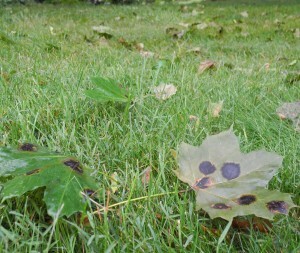 Premature leaf drop due to Tar Spot. 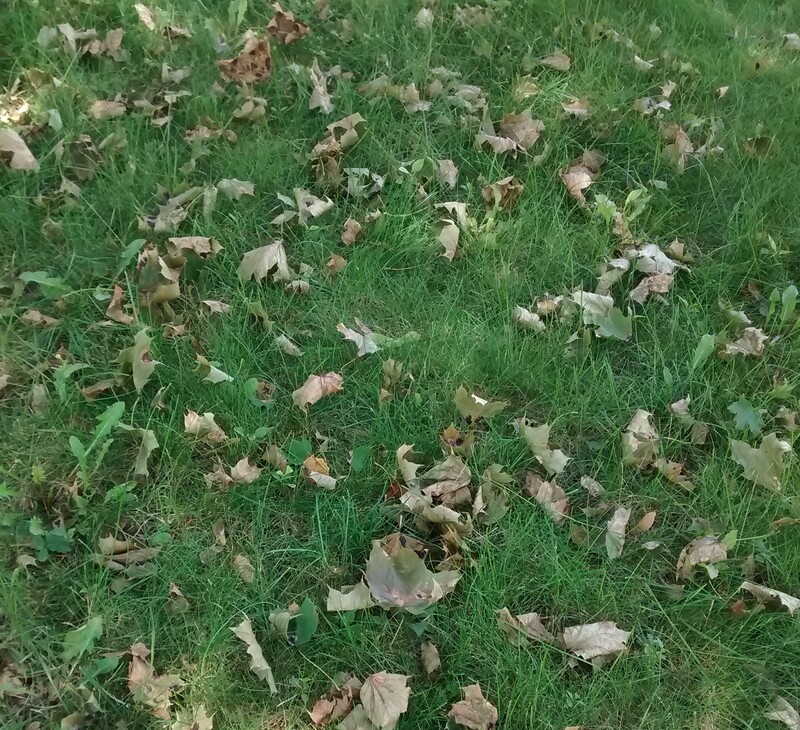 Norway maple leaves on the ground in August and early September? Noticing black spots on the green leaves? The Tar Spot fungal disease of Norway maples is prevalent this year. There are black spots and the leaves are falling. We’re noticing the symptoms now but it all started in the spring as the new young leaves were expanding. At that time of year they can become infected by spores that are released by from spots on last year’s leaves. Those spores can drift via air currents and if they reach a Norway maple leaf and it there’s enough moisture then it will grow inside the leaf. It is a slow process and the first symptoms aren’t noticed until mid summer, but by late summer and early fall we can see the results of those spring time airborne spores. Leaf drop occurs when the Tar Spot lesion develops on the leaf stem or petiole and cuts off the pipework to the rest of the leaf. Will this cause my tree to decline? 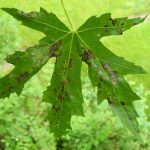 For concerned homeowners the good news is that this disease does not affect the overall health of Norway maples and they will produce a full canopy of leaves again next spring. 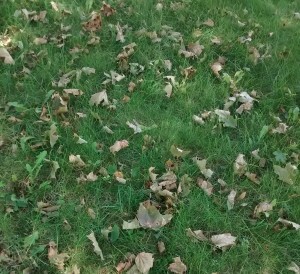 Will it help to remove the fallen leaves with spots this fall? Yes, somewhat, but since the spores can drift through the air the infection can still take place from airborne spore originating nearby. With the variations in spring moisture from year to year the amount of the disease also varies annually. 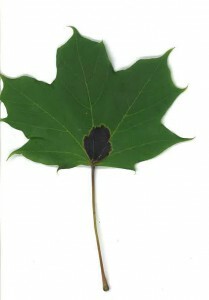 Tar spot on Norway maple tree branch foliage. Composting is okay! A Cornell study by Dr. George Hudler concluded that the leaves can be composted with no danger of spreading the disease as long as those leaves are not exposed to air at the top of the pile the following spring when they would be releasing their spores. Leaf lesions on Norway maple. 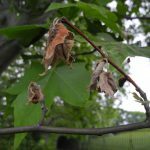 Although once popularly planted as a landscape tree, the Norway maple has a bad habit of shedding a copious number of seeds each year. The subsequent seedlings have invaded wild forests and crowded out some of our native plant species. 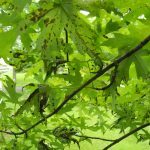 In the spring of 2015 they became regulated and now any Norway maple trees sold in NY state must be accompanied by a label with the words “Invasive Species- Harmful to the Environment”. 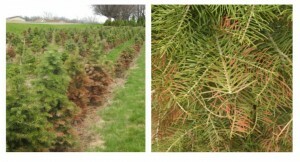 Many growers were looking at winter injury at this time last year. This winter the cold weather was even more severe across NY and the Northeast. So unfortunately much of what we mentioned last year is true again. Grand fir trees with winter Injury. More severe damage above the snow line. Needle browning due to low temps on Grand fir. 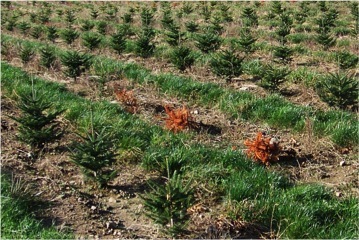 Varying levels of winter injury on a field of concolor fir. Although most of the affected trees will survive with the buds and new growth unaffected, this occurrence, two years in a row now, has some growers questioning whether they’ll put in more of these tender species. 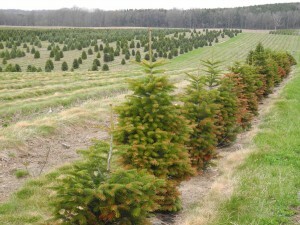 A diverse Christmas tree planting in Upstate New York. A large planting of a single species is easier to manage and harvest but can be a windfall for pests. Monocultures allow insects and disease to expand rapidly as the pest can move unimpeded from one plant to another. 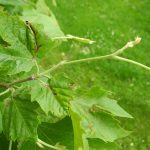 After the devastation that occurred in community forests with streets lined exclusively with American Chestnuts (Chestnut Blight) and American Elms (Dutch Elm Disease), planting a diversified mixture of trees is now the standard practice among municipalities. 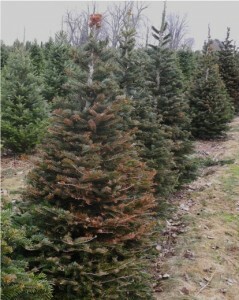 Dead Fraser fir with healthy Canaan Fir foreground and Turkish fir behind. 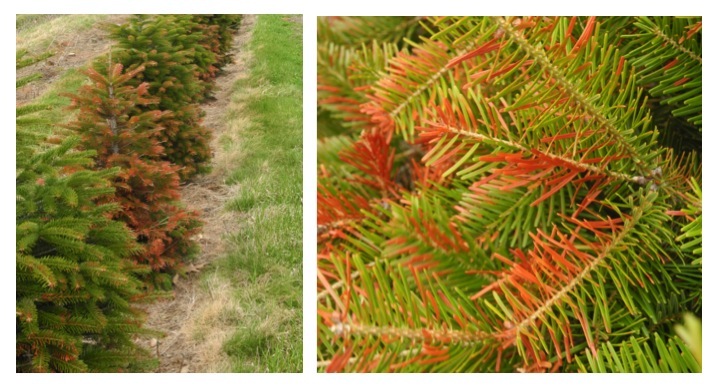 Many nursery and Christmas tree growers also know the advantages of growing a variety of species. 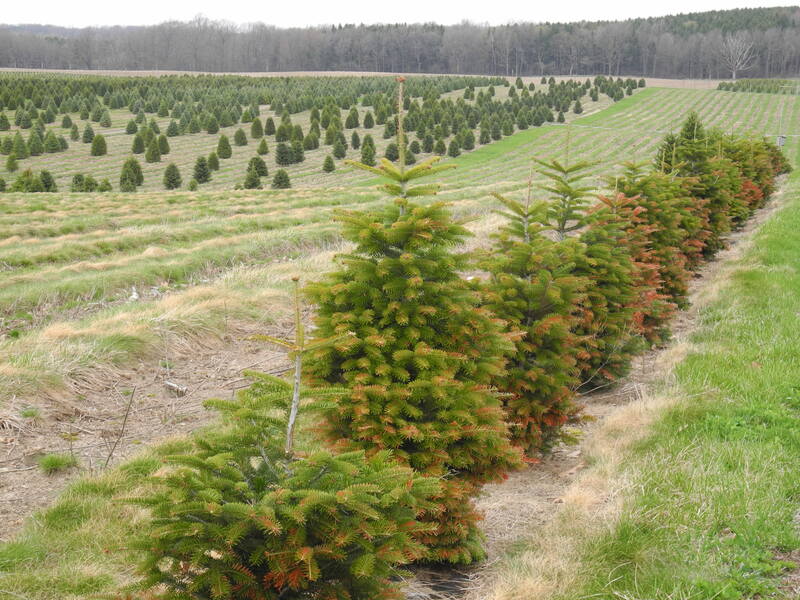 They’ll choose tree species to fit their different environments on their farm. 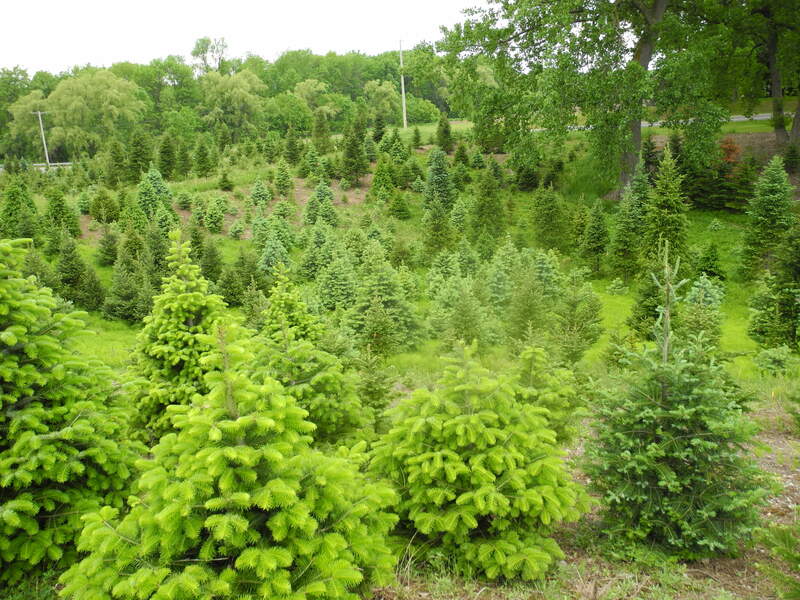 Then just like the smart investor who has diverse portfolio to minimize risks in the future, diverse plantings can prevent pests from moving in and wiping out all the trees. Even landscape designers when working with customers who envision a planting of a single species will often try to specify a mixture of similar species to increase resilience. 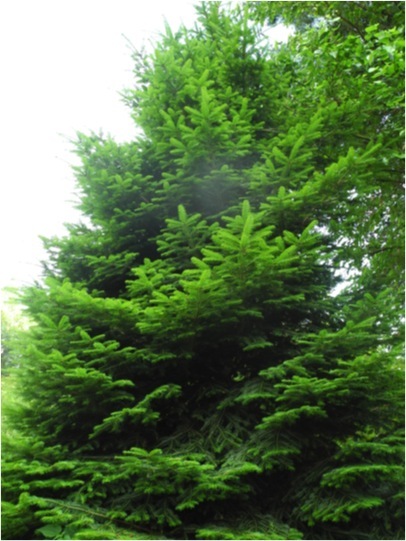 There’s increased interest in Turkish firs such as this example of Abies bornmuelleriana because of it’s root rot resistance. Having a diverse planting works because most insects and diseases have preferences for the host species they feed upon. 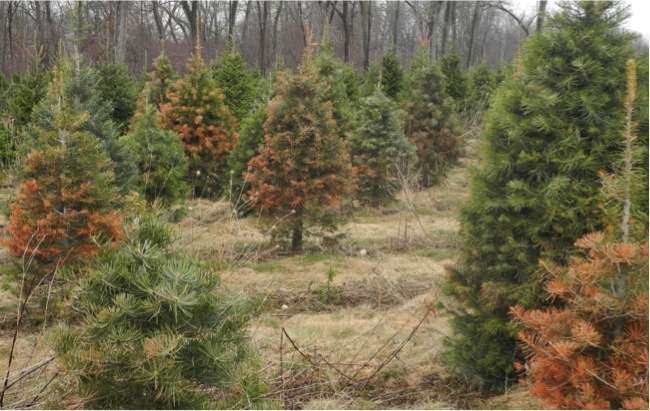 Many simply cannot live on a different genus, for example it is rare to find an insect or disease that lives on both fir and spruce trees. In addition certain sites on a farm or landscape may be more conducive to one species over another. For example if a species is mis-matched on a site with soil conditions it cannot tolerate, then the whole planting may succumb to a root rot. 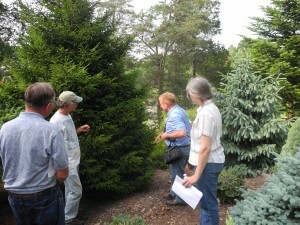 Growers taking notes on new tree species they may want to add to their plantings while at Cornell Plantations. Cornell Plantations is one place where you can experience and compare a wide variety of deciduous trees and conifers. 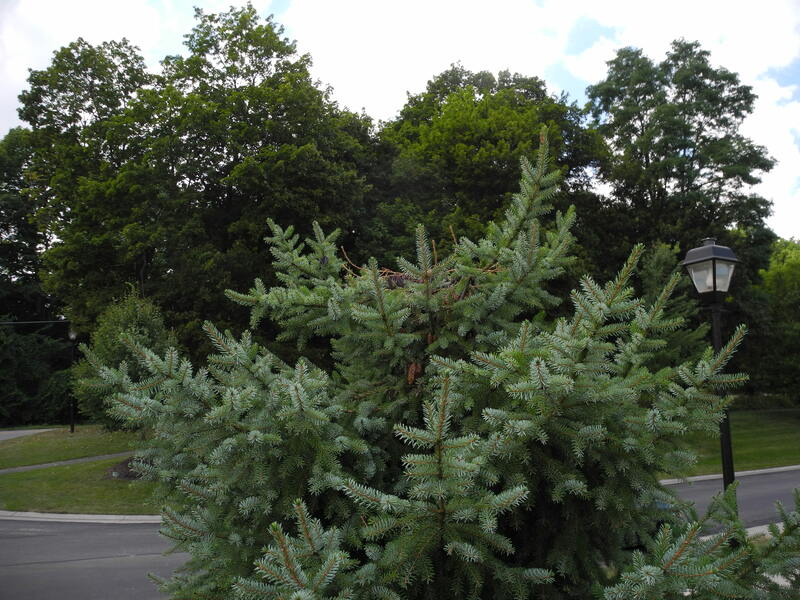 Although their plantings extend over several acres on campus, a concentration of conifers can be found at the Kienzle Overlook. 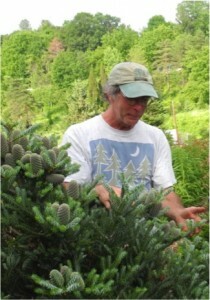 http://www.cornellplantations.org/our-gardens/botanical/kienzle-overlook . 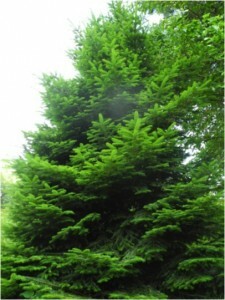 At this website you can find a list of the 80 + conifers species that are in that planting. Phil Syphrit pms26@cornell.edu is the curator of this collection and can help answer questions on some of these unusual conifers if you are interested in adding them to your plantings. 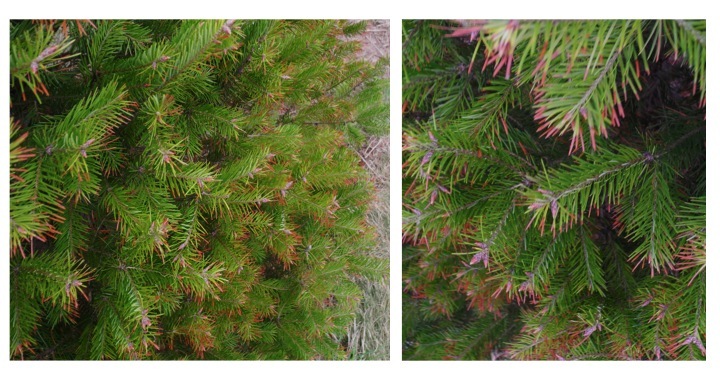 Notice needle damage on pine trees? Look close. 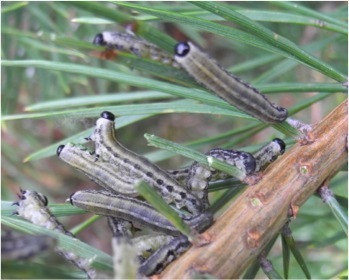 It may be caused by conifer-feeding sawflies. Sawflies? 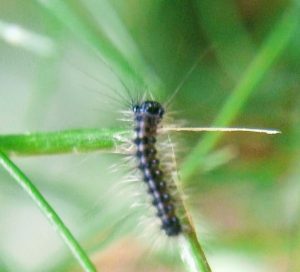 As larvae they look caterpillars which might develop into moths, their name implies they’ll be flies, but they actually become non-stinging wasps as adults. And the saw? As adult wasps the females cut slits in pine needles with saw-like structures on the tip of their abdomens and lay eggs into these openings. Checkout the synchronized movement they make to deter predators! Although there are several species of sawflies that can be seen on conifers the gray-green European Pine Sawfly (Neodiprion sertifer) is represented in this post. Monitor to detect infestations before they reach a size that can cause significant needle loss. 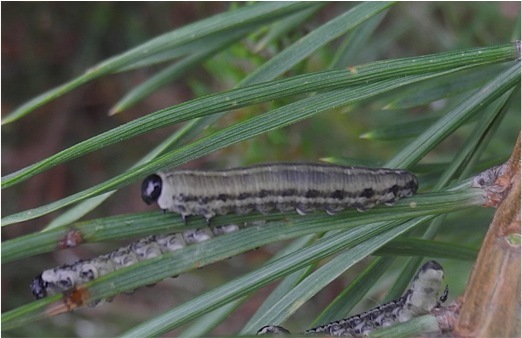 Know that sawfly larvae are attractive as food to parasites and predators and are usually kept in check by these natural enemies. 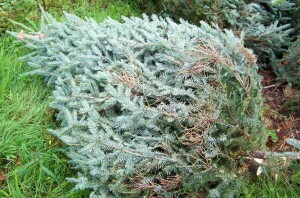 If a small outbreak occurs they can often be handpicked, or pruned out and destroyed. For rare situations where the population of sawflies are high insecticides labeled for their control can be used. What a winter! It was long and cold. We experienced a couple of polar vortex events and subzero Fahrenheit temperatures were common. 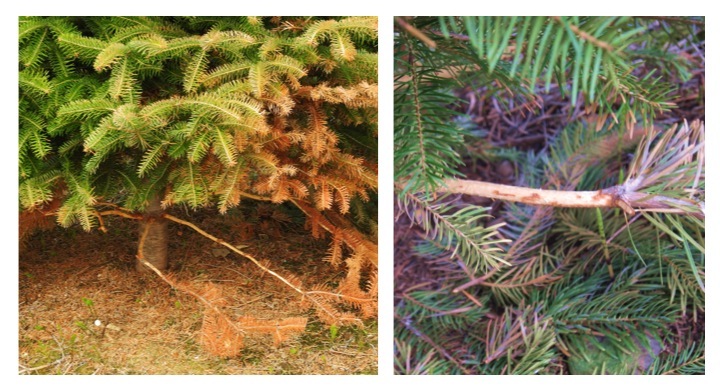 Winter injury symptoms of needle browning visible in the foreground on Nordmann fir trees. Evergreen trees and conifers were impacted by the extreme conditions. 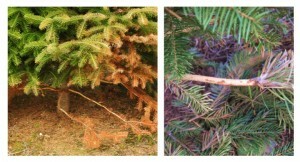 The symptoms of the winter injury has been showing up on evergreen needles for the last month or so. 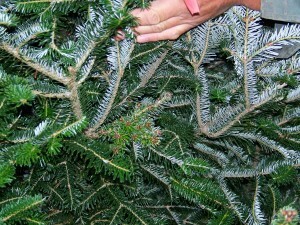 The damage is appearing as needle browning– sometimes whole needles and sometimes just the tips. Winter Injury symptoms is common Nordmann firs. 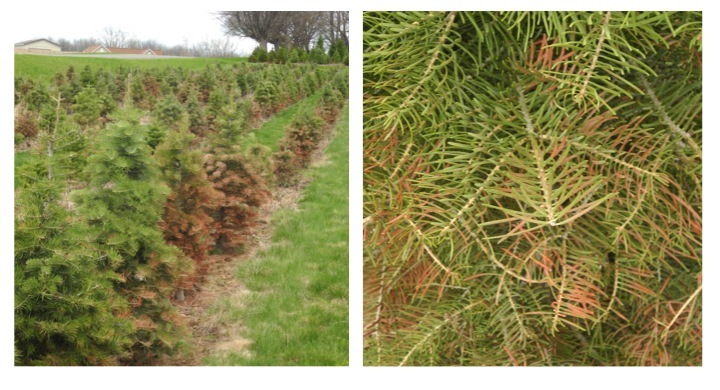 Grand fir trees are also showing winter injury symptoms in many parts of NY. 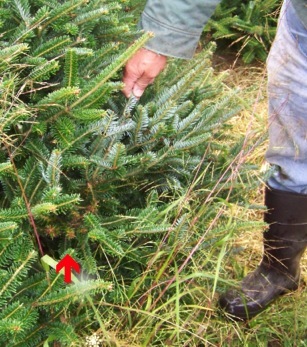 Douglas fir trees that have Swiss needlecast infections were most prone to winter injury. 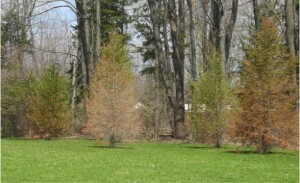 Untreated Douglas fir trees in in the landscape. Suffering from a combination of Swiss needlecast and winter injury. 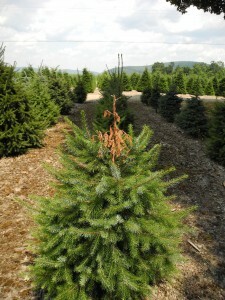 Concolor fir trees planted in sites with poor drainage were susceptible to winter injury. The good news is that in almost every case the buds are fine! 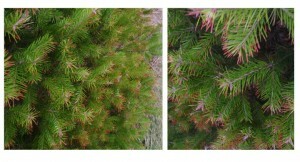 So the new growth will soon help cover up the brown, winter injured needles. Be sure the soil conditions are optimum to maximize growth. Adjust pH and fertilize as needed. 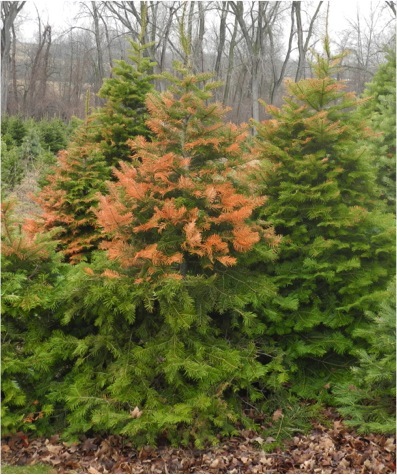 Fir Broom rust is becoming more common in New York as the number of fir tree plantings increase. 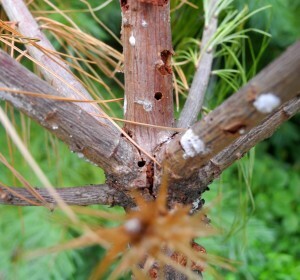 This disease produces a proliferation of shoots “witches brooms” that can make the tree unsalable. 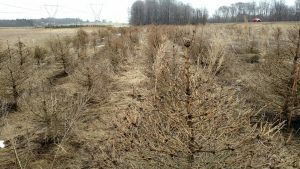 Severe Fir Broom Rust can cause losses for growers. The fall and the upcoming sale season, are a good times to see if it is present in the field. When taking off the bottom limbs of trees be sure to take notice if any brooms are present. Also when the trees come in during harvest season keep an eye out. Because the affected growth is shorter than the surrounding branches it is often hidden. 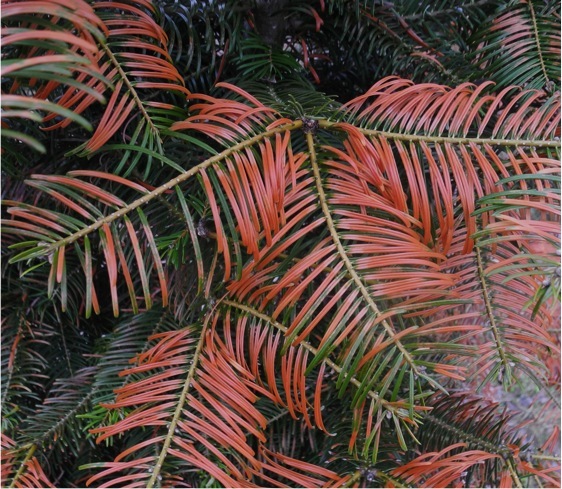 The disease often shows up on the lower branches first where the rust fungus benefits from increased moisture in the shaded lower canopy. The lower branches are also to the source of the spores that are coming from the chickweed plants. 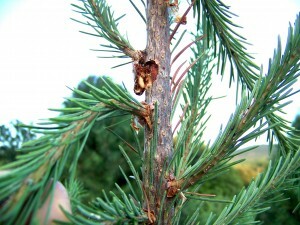 The infection of the firs happens in the spring when rust spores travel from chickweed to fir tree needles at bud break. 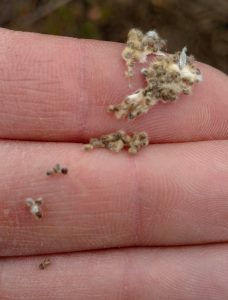 With enough moisture those spores can germinate, penetrating the needles and later in the season producing spores on the needles that can only infect chickweed, continuing the cycle. 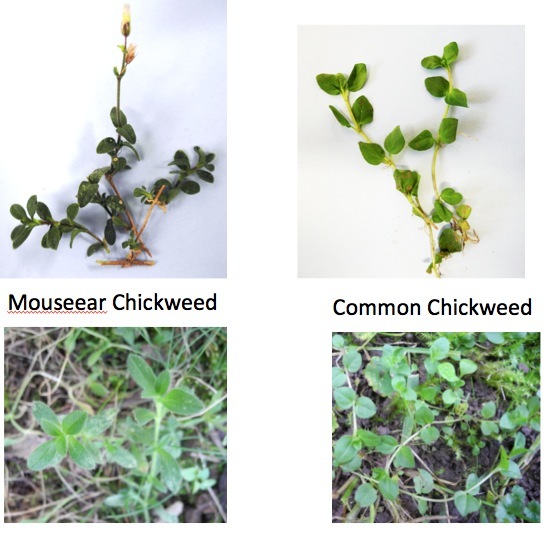 Both mouseear and common chickweed are susceptible to this disease. These weeds often grow unnoticed amongst grasses in Christmas tree fields. 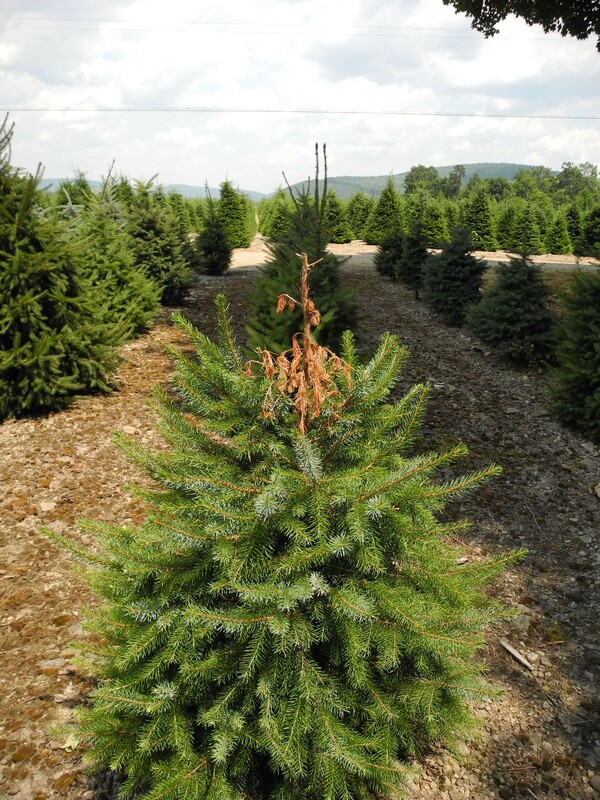 There are no fungicides registered to control this disease on fir trees. Fortunately it can be managed by controlling the chickweed in the field with broadleaf herbicides. 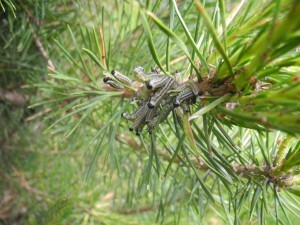 Dieback due to white pine weevil larva feeding. 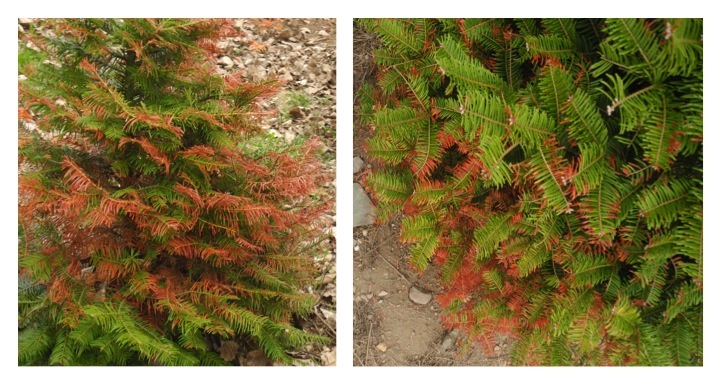 Noticing a wilted leader on pines or spruces? 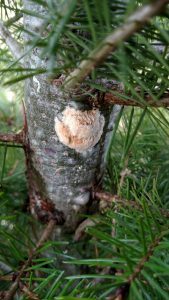 White pine weevil is likely the culprit. 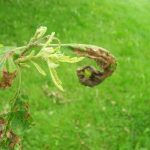 Although it’s almost officially summer when the symptoms are first noticed it all started back in the early spring when, on a warm day in March- April, the female weevil lays her tiny eggs a few inches below the terminal bud. 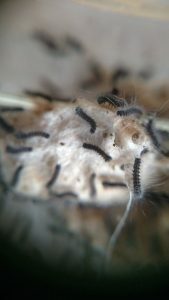 Those eggs soon hatch and the young larvae start to consume the stem’s vascular tissue. With the loss of this vascular pipework the tree’s terminal leader wilts and brown dieback soon becomes visible. 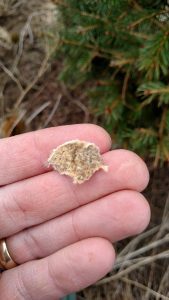 With the bark peeled back, a white pine weevil larva is visible inside spruce leader. In late July and August adult weevils emerge through small holes they carved at the base of the dead terminal. After the adult weevils emerge they enter leaf liter and are not seen until March of the following year. If you prune out and destroy the affected leaders before the holes appear and the adults emerge (Late June to mid-July for most of New York) you can reduce numbers of adults that will lay next year’s eggs. Exit holes of at base of area damaged by White Pine Weevils. Prune and destroy before these are visible. A blue spruce disfigured due to a missing leader caused by White Pine Weevil damage. White pine weevil is one of the earliest pests we treat for in the spring. Knowing when to treat can be tricky. Using growing degree days in the spring can be helpful to prevent damage. Do you recognize this one? 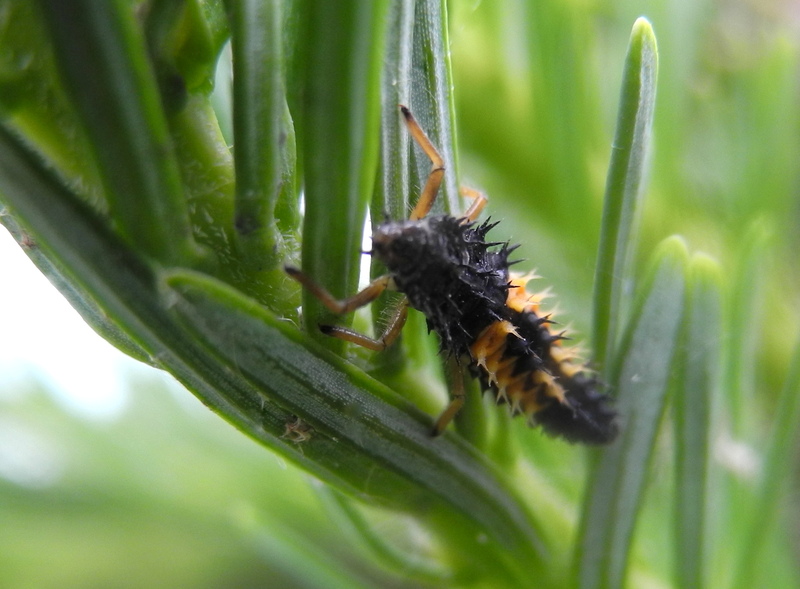 I saw this insect at a couple of tree farms during the last week of May and first week of June. This is an immature ladybug a.k.a. Ladybird beetle. The ladybug larvae, like the adult beetles they become, are voracious eaters of aphids and other insects. Ladybug larva. Click on image for larger view. The larva becomes a pupa before morphing into an adult beetle. 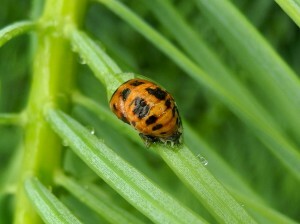 An adult ladybug may consume 5000 insects in its lifespan. The ladybug on the right is on its way to a meal of balsam twig aphids. This is a good sign. 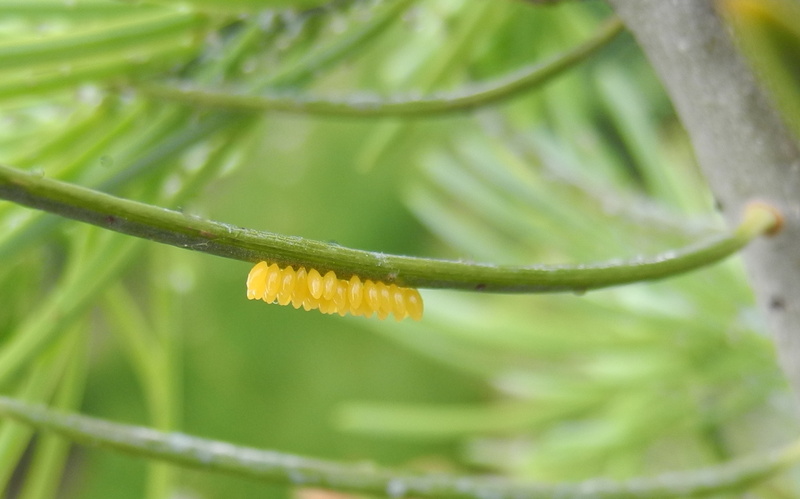 Bright yellow ladybug eggs hanging from a fir needle means more of these “eating machines” will be hatching soon. There are many other beneficial creatures, which feed on pests in tree farms and often go unnoticed. These include “good” mites, various predatory and parasitic insects, spiders and even birds. By keeping pesticide applications to a minimum the populations of the beneficial partners are maintained and nature can do its good work without us even knowing it.